64 pp, 8.5" x 8.5"
LaNana Creek, or Bayou La Nana as it appears on older maps (Bayou is a Louisiana-French word for creek, from the Choctaw bayuk; La Nana is an affectionate term for "grandmother" in both French and Spanish), is a 21-mile-long creek that runs through a mix of open farmland and woods, serving a variety of forest and riparian ecosystems. It rises a few miles north of the city limits of Nacogdoches, runs south along the town's north/south axis, and then flows further south to join the Angelina River at the border between Nacogdoches County (to the north) and Angelina County (to the south). LaNana and its sister creek and principal tributary Banita, in their flows from north to south through Nacogdoches, have cut two valleys (LaNana on the east, Banita on the west) leaving a ridge between them where the town of Nacogdoches sits. The town's name is derived from the Caddo word for "place of places," or "high place." Long before the arrival of Europeans, local Indians [the generic term preferred by most tribes today] used a trail that ran along this same ridge, a trail overlain by the current North Street. The town is built on the site of one of the largest Caddo villages in the area, originally marked by three mounds, only one of which is still visible. The villagers were members of the Caddo-speaking people later known to the Spanish as Tejas (Caddo for "friend"), with connections to the Mississippian mound-builder cultures whose economic and social influence extended across many parts of central North America from the ninth to the 15th centuries. Even after this influence declined, the Caddo continued living in East Texas, and were still in the Nacogdoches area when the Spanish arrived more than a century later. The surrounding country is rolling and hilly; the differences in elevation between the creek bottoms and the ridges are modest, but form dramatic features in this terrain, which is typical of Deep-East Texas Pineywoods. For example, while the creek beds are around 330 feet above sea level, elevations along North Street and on the ridges further to the east and west of the creeks approach 500 feet. Many features of the area, both in topography and biology, are the legacy of its geological history as part of the Western Gulf Coastal Plains, which have been subject to numerous incursions of the sea from the south over the past 60 million years. The resulting fertile, loamy, sand-and-clay soils, combined with a humid subtropical climate, support a rich mix of birds, terrestrial animals, and plants, and the ecosystems along LaNana and Banita creeks reflect the biological variety of the region in general. A walking-trail sign at the Pineywoods Native Plant Center on the campus of Stephen F. Austin State University notes that in this part of the East Texas Pineywoods, a total of five ecosystem types converge and blend: prairies, deserts, tropics, swamps, and forests. The area is also a major migratory corridor for birds following flyways linking the Arctic with the Gulf Coast, Central and South America. Since the late 1970s, Dr. Francis E. Abernethy, Professor Emeritus of English at SFA, along with other SFA faculty and a host of community advocates and volunteers, have worked tirelessly to keep this invaluable natural heritage accessible to the public. They have devoted untold hours of labor to establishing a remarkable system of trails in Nacogdoches, focusing primarily on LaNana and Banita Creeks – and it was walking the LaNana Creek Trail that led to the idea for this book, begun in January 2013, to celebrate the delight my husband and I have had on our morning walks along the trail since we moved to Nacogdoches in 2001. When in 2013 I shared the concept of this book with Dr. Jerry Williams of SFA's Department of Social and Cultural Analysis, including my wish to include informative end-notes, he suggested the names of several local experts I might turn to for help. Those people have proved extremely insightful and forthcoming with their knowledge, and I wish to acknowledge their generosity; their names, full titles, and affiliations are cited at the head of the notes. 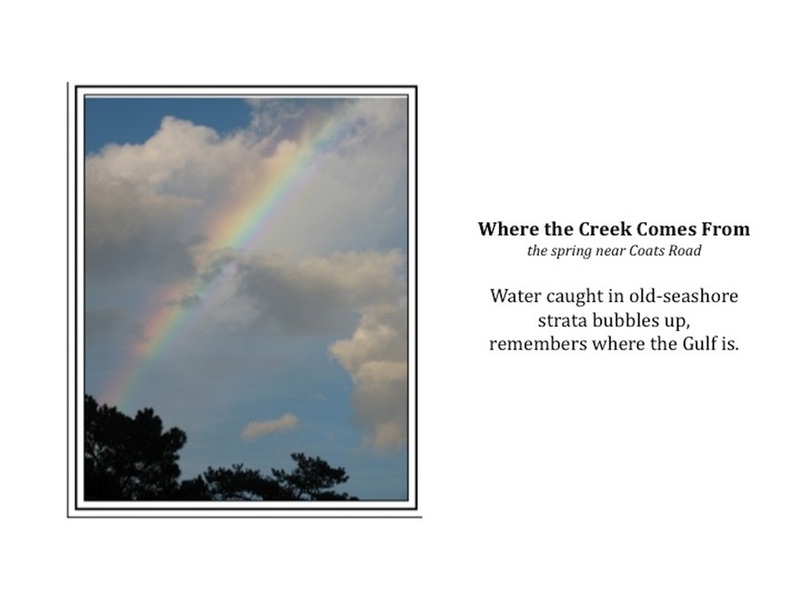 I thank them for helping me better understand the history and biology of this beautiful and fascinating part of the East Texas Pineywoods, and its "grandmother" LaNana Creek. Note 1, top p. 47, end paragraph 2: Texas Water Development Board's (TWDB) Report 345 by Ashworth & Hopkins, ﻿Aquifers of Texas﻿. Note 1, top p. 47, end paragraph 3: The Handbook of Texas Online. Note 2, lower p. 47, last sentence of note: TWDB's report on water in and around Nacogdoches. Note 5, mid p. 49, end paragraph 2: TWDB's online map of the surface geology in the Nacogdoches region. Note 5, mid p. 49, end paragraph 3: Texas Parks and Wildlife Dept's Birds of the Pineywoods of East Texas; a Field Checklist; and the checklist by the Pineywoods Audubon Society. Note 6, mid p. 50, end paragraph 2: remarks by Dr. David Creech in 2014 at the dedication of the Ina Brundrett Conservation Education Building at the Pineywoods Native Plant Center at SFA. Note 6, mid p. 50, end paragraph 3: map and additional information on the Pineywoods Native Plant Center at SFA. Note 7, top p. 51, end top paragraph: more about analemmatic sundials. Note 10, top p. 53, end top paragraph: ﻿Dr. Matthew Kwiatkowsky's talk﻿ from 2013 about the reptiles and amphibians of E. Texas. Note 15, top p. 55, end top paragraph: the Texas Historical Commission's Texas Heritage Trails Program, specifically the Texas Forest Trails region headquartered in Nacogdoches. Note 20, p. 57, paragraph 2: more information on the 2014 book Let the River Run Wild! about the Neches River, by Dr. Francis E. Abernethy and Adrian Van Dellen, published by the SFA Press.